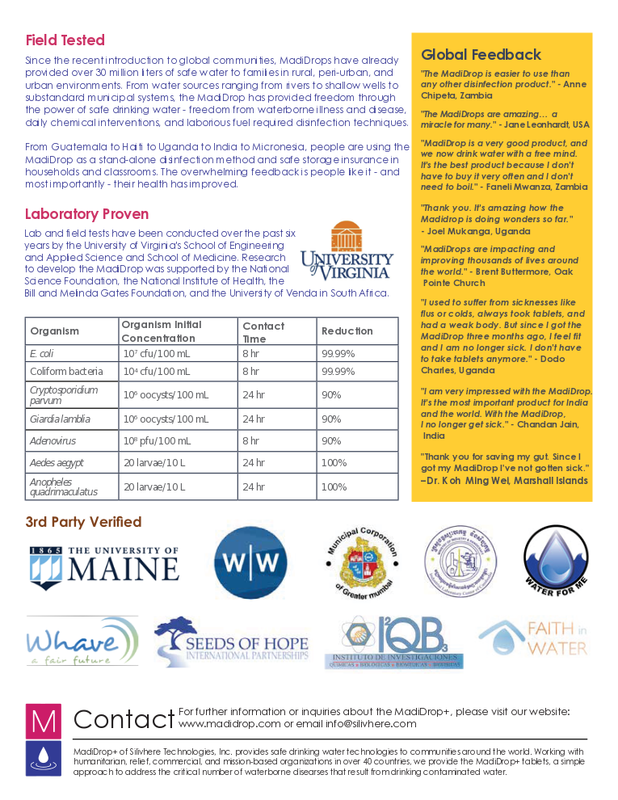 The MadiDrop+ is an excellent tool for continued prevention of waterborne disease and illness at the household level. Disinfect the household’s daily water supply. Protect stored water from contamination. No chemicals, fillers, or other related materials are used in the production process of the MadiDrop+. It is made entirely of all-natural materials (clay and silver). The MadiDrop+ is a micro-porous, water permeable ceramic tablet infused with microscopic silver clusters. The base antimicrobial is 99.9% pure mechanically bonded silver. Available for download as a PDF in English, Spanish, and French.